Mark Shoff's turned the streets of Covina, California into a giant car show for his massive collection of mostly junky beaters. Neighbors don't want to live in a giant junkyard, but Shoff's found loopholes in the parking laws. Photos of the streets show a collection of older cars of varying collectability, ranging from a nice vintage Mercedes to a Black Dodge Dart with a busted window. 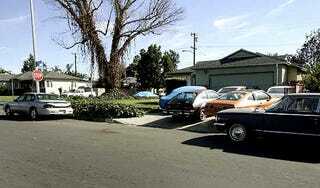 Many of the cars are dented or damaged and lack proper registration, says the San Gabriel Valley Tribune. To foil Shoff's giant car show, residents encouraged the passing of regulations forcing cars to be moved every 72 hours and not parked on certain streets on Tuesdays. But Shoff is aware of how the system works and moves them a few inches on those days or switches the streets they're parked on with the help of an unidentified female.